This week in Eugene, Oregon, the nation’s best high school athletes gather to display their skills on the grandest stage of recruiting camps. Not only does this event present an opportunity for these athletes to compete in the offseason and display their skills on a nationally recognized platform, such as Richard LeCounte’s four interceptions on Saturday, but it also opens a door for player-to-player recruiting. As you may figure, the loaded 2017 recruiting class for Georgia is well-represented. The Bulldogs currently have commits Jake Fromm, Trey Blount, De’Antne Demery, Jaden Hunter, William Poole, Robert Beal and Richard LeCounte on hand. These committed players are putting up numbers which rank in the top percentiles among the players represented nationwide, but they’re also having frequent conversations and building relationships with fellow recruits, all in an attempt to get them to tag on at Georgia and build a national power. Fromm, the top-rated quarterback in the state of Georgia, showed his Twitter followers how his group of Georgia targets are well-represented. As both current commitments and targets highly pursued by Georgia are shown, gathering these recruits to stay in-state at the collegiate level is at the top of the priority list. There may be some foreshadowing in there as well, as running back Toneil Carter is from Texas and Kenney Britt are also represented, and have Georgia near the top of their leaderboard. Is Fromm trying to say that those two are Georgia-bound as well? Only time will tell. 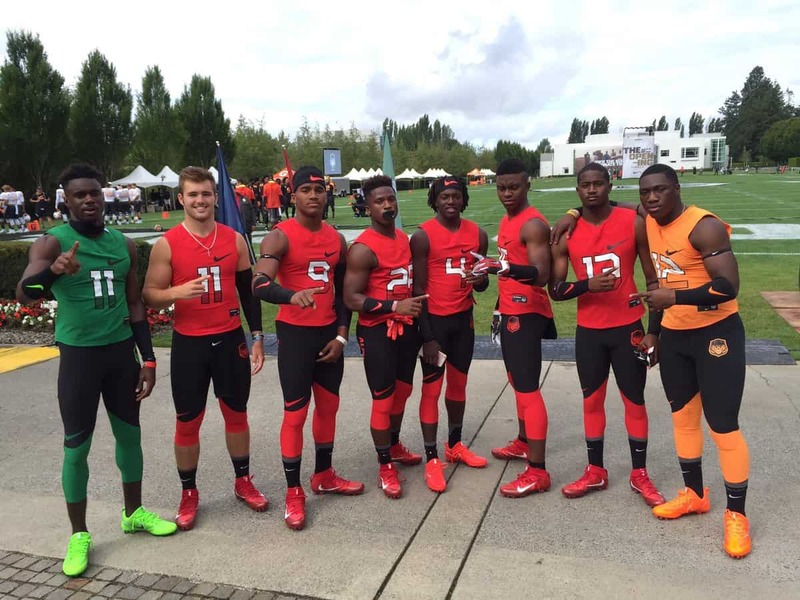 This Nike event provides a platform for these athletes to discuss their options, make a commitment or trim down their list of offers. As hinted by current commit Trey Blount, Sunday could be full of fireworks for Georgia and their staff. Georgia is hoping to land both the previously mentioned four-star running back Toneil Carter, who has been rumored to be a heavy Georgia lean as well as the nation’s 10th overall offensive lineman Andrew Thomas. These two additions would make Kirby Smart’s 2017 class one of the best in Georgia’s program history. In addition to Sunday, Georgia hopes this event serves as a moment for targets to make memories with those headed to Athens and add them on after they have a chance to talk it over when returning home. Kenny Britt and Jamyest Williams are planning to do just that, as Britt plans to announce his decision in August and Williams plans to narrow his options down to five before returning home. The master player recruiters, Poole and LeCounte, definitely hope to leave a lasting impression. It looks to be the same way for defensive end Malik Herring, as he and Fromm had made an agreement for when they face-off in the football season. All in all, “The Opening” seems to be filled with fun and a chance to improve with the nation’s best, and Georgia hopes it pays off for their program in the near future. That could definitely be true on Sunday, as hinted by Trey Blount and others, a monster day could be just around the corner.